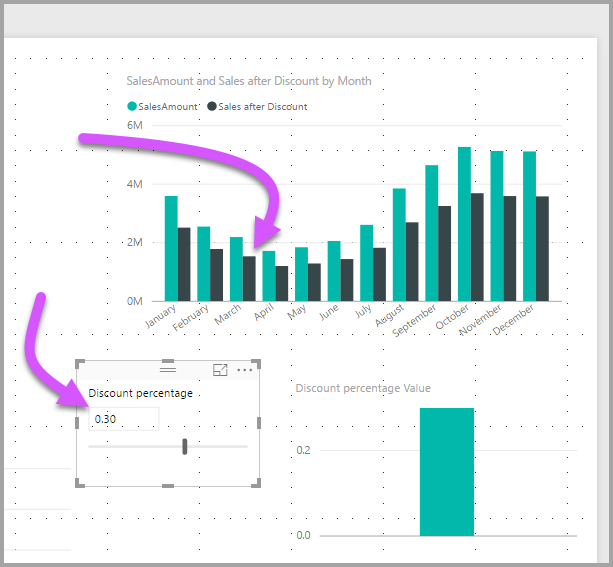 Starting with the August 2018 release of Power BI Desktop, you can create What if variables for your reports, interact with the variable as a slicer, and visualize and quantify different key values in your reports. 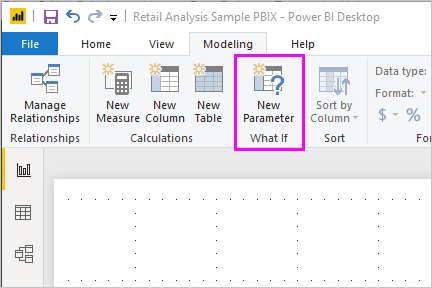 The What if parameter is on the Modeling tab in Power BI Desktop. When you select it, a dialog appears where you can configure the parameter. 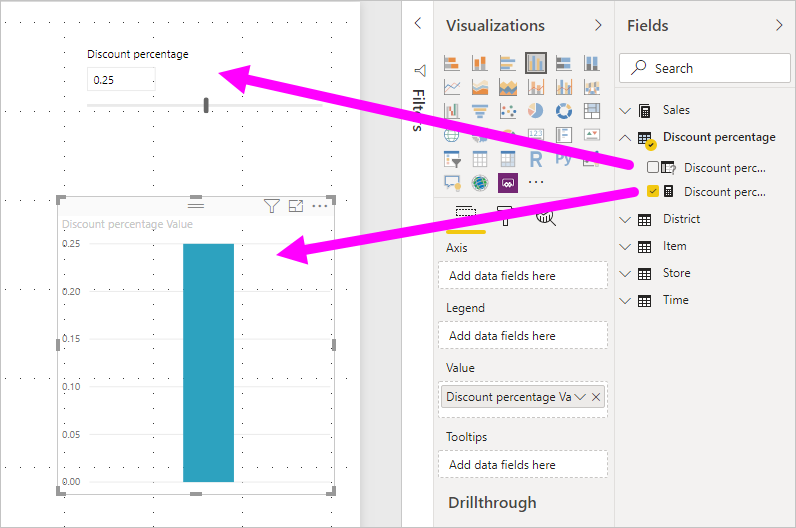 To create a What if parameter, select the What if button from the Modeling tab in Power BI Desktop. In the following image, we've created a parameter called Discount percentage and set its data type to Decimal number. The Minimum value is zero, the Maximum is 0.50 (fifty percent). We've also set the Increment to 0.05, or five percent. That's how much the parameter will adjust when interacted with in a report. For decimal numbers, make sure you precede it with a zero, as in 0.50 versus just .50. Otherwise, the number won't validate and the OK button will not be selectable. For your convenience, the Add slicer to this page checkbox automatically puts a slicer with your What if parameter onto the current report page. 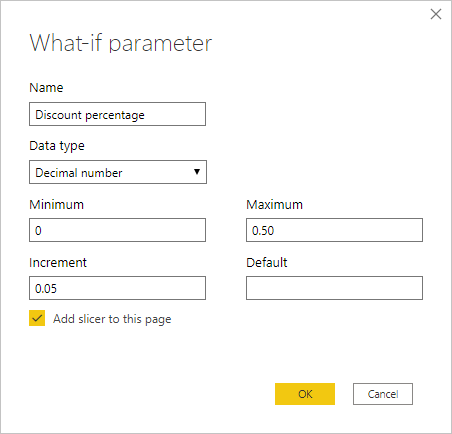 In addition to creating the parameter, creating a What if parameter also creates a measure, which you can use to visualize the current value of the What if parameter. It's important and useful to note that once you create a What if parameter, both the parameter and the measure become part of your model. So, they're available throughout the report and can be used on other report pages. 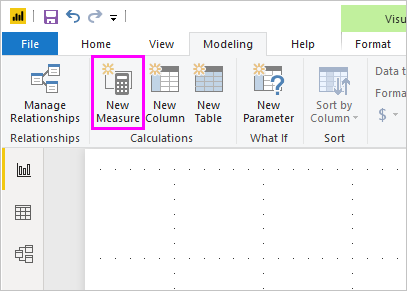 And, since they're part of the model, you can delete the slicer from the report page, or if you want it back, just grab the What if parameter from the Fields list and drag it onto the canvas (then change the visual to a slicer) to easily get the parameter back into your report. Let's create a simple example of using a What if parameter. We created the What if parameter in the previous section, now we'll put it to use by creating a new measure whose value adjusts with the slider. To accomplish this, we create a new measure. The new measure is simply going to be the total sales amount, with the discount rate applied. You can create complex and interesting measures, of course, that let the consumers of your reports visualize the variable of your What if parameter. For example, you could create a report that let sales people see their compensation if they meet certain sales goals or percentages, or see the affect of increased sales to deeper discounts. 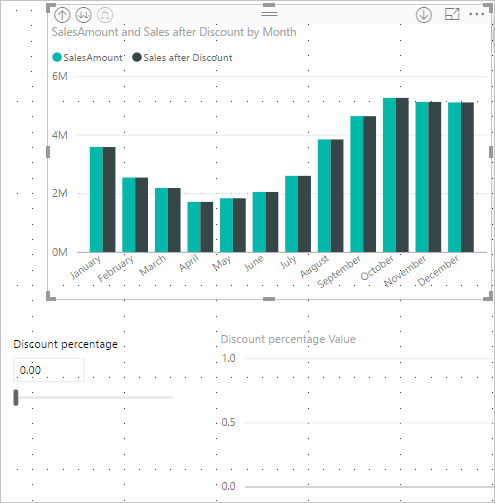 Then, we create a column visual with OrderDate on the axis, and both SalesAmount and the just-created measure, Sales after Discount as the values. Then, as we move the slider, we see that the Sales after Discount column reflects the discounted sales amount. And, that's all there is to it. You can use What if parameters in all sorts of situations, to enable the consumers of reports to interact with different scenarios that you create in your reports.